Lila Gemellos, 30, has been painting across the Silicon Valley for several years. She brings her strong San Jose roots to her artwork in her visual narratives. Her passion for art became apparent early on in her life. Lila took her first art classes at 5 years old and began oil painting at the age of 8. 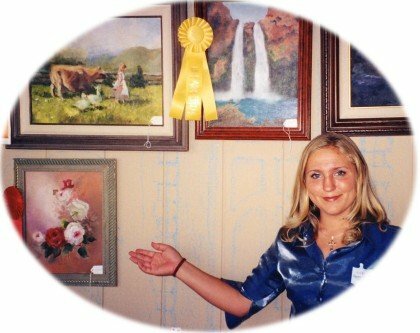 At age 9, she won Best of Show in the Santa Clara County Fair, as well as other Fair awards over the years. After studying at the University of California, Riverside, she returned to Santa Clara County and began working in the corporate world of commercial real estate and property management. She brings this experience to every project and contract. Gemellos executes a mural in a way that allows businesses to remain open, and leaves things as clean and precisely as she found them. She understands the concerns of her customers, because she’s worked on behalf of landlords and business owners in other capacities. 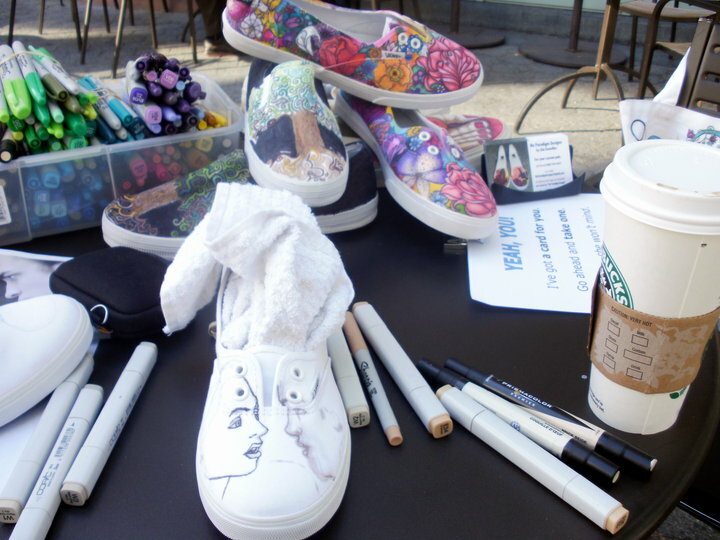 While working in a corporate grind, Gemellos found time to moonlight, drawing on already popular canvas shoes. Her first designs were of feet on classic slip-on Van’s skate shoes. After being laid-off from construction, Gemellos found a natural place to pick up and began drawing in Starbucks across the Silicon Valley for hours a day. Having painted murals through college and always having the desire to focus on art of a larger scale, her shoes created an excuse to discuss her goals with interested strangers. They became a walking advertisement for those stranger to tell other people about this artist they met in a cafe. Now, she has the opportunity to paint all over the place, teaches private art classes and designs her brand of custom shoes and jewelry from recycled materials. Lila Gemellos is a vendor at several art’s festivals and shows every year, sharing her view of classic art off the traditional canvas. Her shoes, stationary and jewelry can be found at www.thesoulshoppe.com. 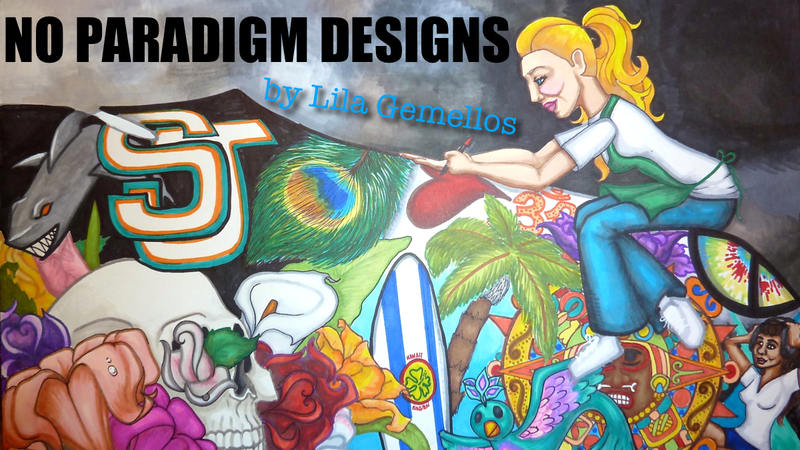 Gemellos also writes a popular Art Blog based on her experiences in the classroom, www.lilasartclasses.com, and has art students all over the world. Each job is blessing and an opportunity not given or taken lightly. Gemellos has been brightening schools and classrooms, bringing edge to trendy businesses and adding joy to people’s homes with the murals she paints. It’s artwork off the canvas. 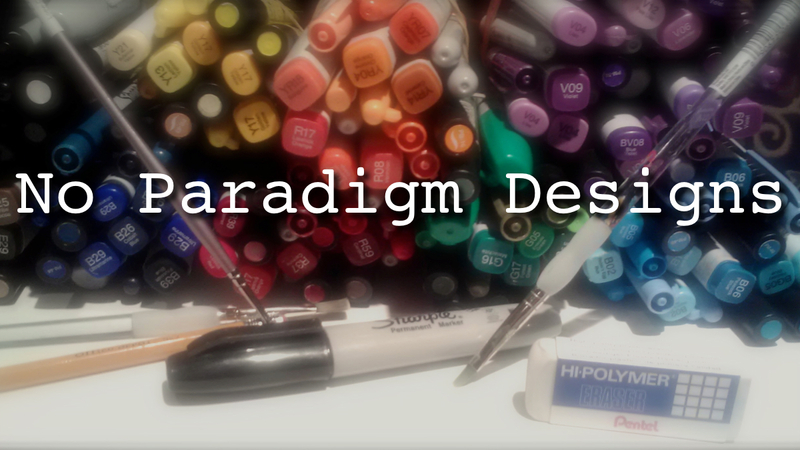 No Paradigm Designs expresses Lila Gemellos’s intent to create artwork outside of convention. Picking just one kind of art was going to be difficult for Gemellos to brand herself. Her murals often create the illusional of space and added depth. Using vivid symbols, she creates a narrative and story within her more conceptual pieces. Gemellos is versatile, being able to paint in a number of styles, restore projects, refinish details, and incorporate new ideas as it occurs to the customer.